This Love and Kisses Teddy Basket is a wonderful gift for your special someone on Valentines Day. 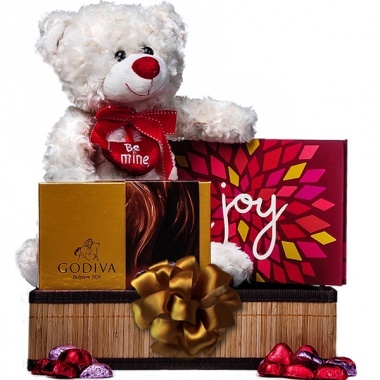 It includes a Plush Teddy with a Be Mine heart around his neck, a box of Godiva candies, and a wonderful keepsake book called Joy, filled with joyful thoughts. Happy Valentine’s Day!